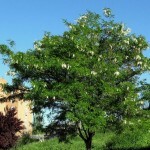 Though pretty and fast-growing, black locust is weak-wooded, short-lived and generally weedy. 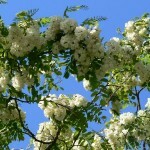 It is hardy, deciduous and forms a broad, upright canopy when mature. Some are more shrub-like. Natural populations are believed to have originated from the eastern United States, particularly along the Appalachians and Ozark Mountains, but have spread across much of the United States and up into Canada. Green to blue-green compound leaves (leaves comprised of many small leaflets) cover its coarse, thorny branches through summer and turn shades of yellow and tan in fall. In spring, it produces pendulous clusters of fragrant, ivory, wisteria-like blossoms. 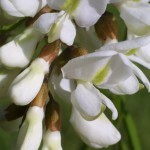 Pink-flowered cultivars are also available. The fruits are dark brown, flattened pods filled with seeds that mature and split open by fall. Its deeply furrowed bark is variable in color and moderately attractive.